This time three years ago, I was spending my second day in hospital after a long and fairly messy birth. DorkySon still didn’t have a name – we had been so sure that we were having a girl that we hadn’t really given much thought to boys’ names – and it was almost a week before we finally settled on one. Those first few days of motherhood were the scariest of my life. I’d never changed a nappy in my life. Now I had to do it with one hand, in the middle of the night, while holding my own catheter bag in the other hand. I had no idea – not a bleeding clue – what to do with this small, wobbly-headed crying thing that I was suddenly responsible for. I was terrified. The wobbly-headed crying thing had his third birthday this weekend. He helped me bake his cake, ripped the paper off his presents by himself, and took an inordinate amount of joy from the big shiny balloon I impulse-bought on Friday afternoon. He melted his parents’ hearts more times than we thought possible. Those early, scary days that we had to fumble our way through now seem like they were many lifetimes ago. I’m sure we are still making just as many parenting mistakes as we were in the early days, but we have the basics mastered. DorkySon eats, sleeps, plays and communicates in a way that we could never have imagined. He is not just a wee crying grub anymore; he’s a person with interests, feelings, desires and dreams. Other times – when he’s tired and needs a snuggle, or when he gets frustrated at his inability fit a jigsaw piece into the right place and he ends up hurling it across the room – we remember that he’s just a little boy after all. Our work as parents – in gently guiding him through life and helping him find all the right paths – is only just beginning. We have fallen hard into the stereotypical parent trap. We post an excessive (and probably quite annoying) number of DorkySon photos on Facebook, and we gush proudly to our friends and family about his every tiny achievement. We had both been warned, but until you experience for yourself how many incredible moments of pride and hilarity and fun there are as a parent, it doesn’t seem quite believable. There is something new to giggle about or marvel at every single day. I’m not ashamed of trying to document the details, because it’s that small stuff that life is made of. A good friend emailed the other day, and when I expressed my shock at how quickly the last three years have gone, she said, ‘The days are long but the years fly by.’ They do, indeed. The days pass by in a fairly monotonous march of toy car traffic jams, walks to the park, Peppa Pig episodes, supermarket visits, piles of laundry and plates of fish fingers. But then when you stop and look back at the years, they are so full of important milestones and developments, and so much seems to have changed so quickly. I can’t believe we’re now entering our fourth year together. 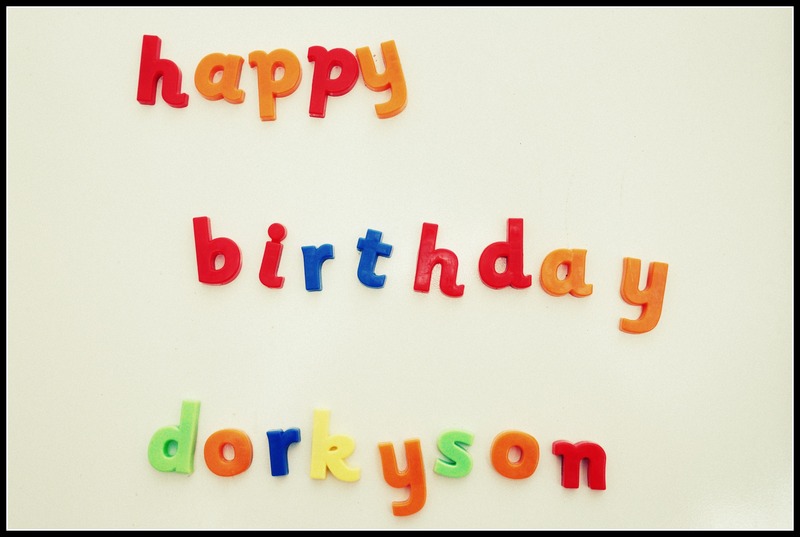 Happy Birthday DorkySon. You are – as you would say yourself – the best boy in the whole world ever. Happy Birthday Dorky Son! What a lovely post to keep and treasure. He’ll be 18 before you know it!